One of my favorite soups of late is this Chicken and Barley Soup, and I CAN’T BELIEVE I HAVEN’T BLOGGED ABOUT IT! 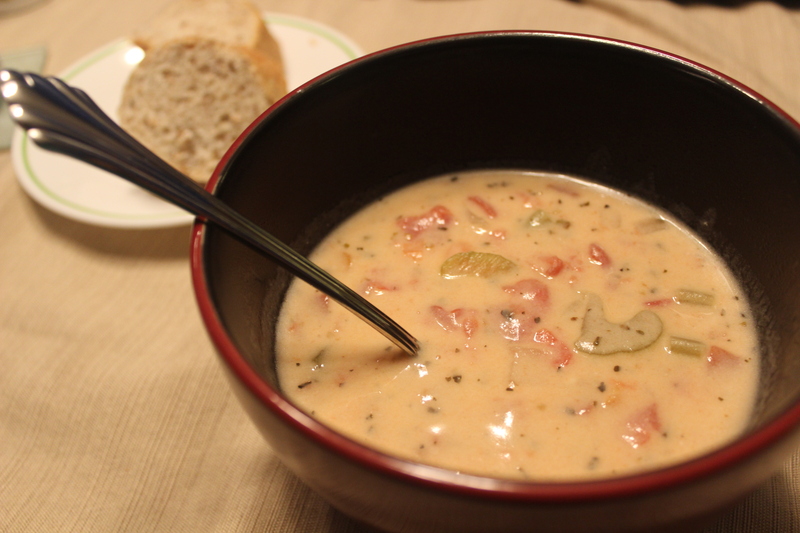 I have made this soup several times, and I love it. Note to self: Make that soup again soon! Anyway, that soup was the first time I had ever had barley, and I instantly became obsessed. 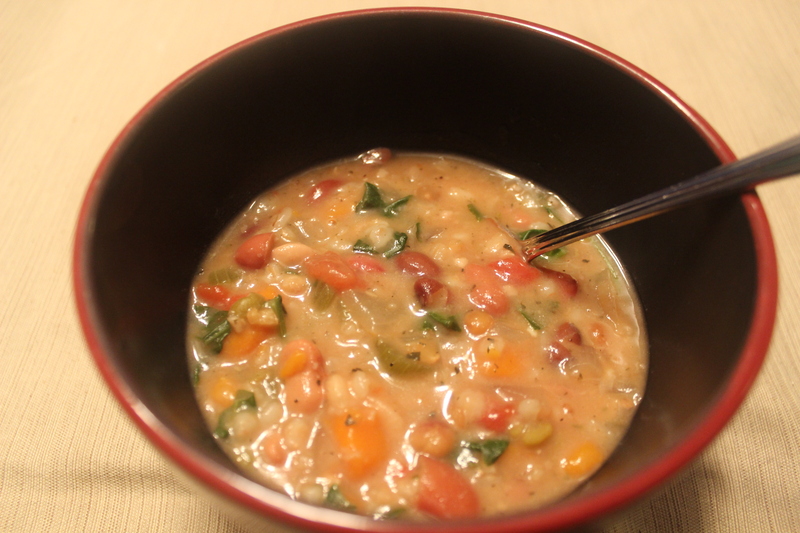 So when I came across this Bean and Barley Soup from One Dad’s Kitchen, it instantly caught my eye. Barley? Check. Meatless? Always a bonus. Delicious? As it turns out, YES! This soup is so good and so filling. 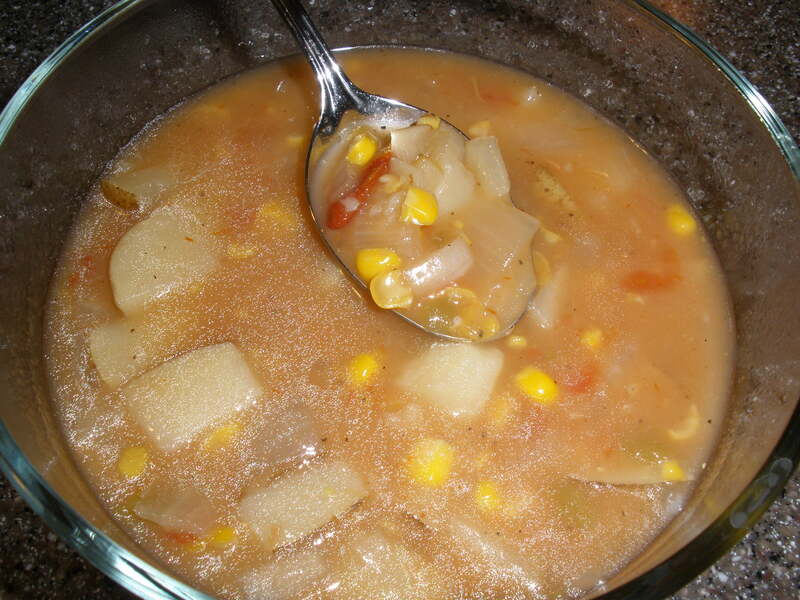 It’s the perfect soup for cold fall or winter days. I love that it’s inexpensive, too. It makes about 6 servings, and there is at least half a bag of beans left to use for another time. Place the beans, barley, garlic, carrots, celery, onions, bay leaf, kosher salt, Italian seasoning, pepper, and tomatoes into your crockpot. Add 6 cups of water and stir well. Cook on low until the beans are tender and the soup is thick, about 8 hours. At end of cook time, add the spinach and Parmesan cheese, and stir. Continue to cook on low until the spinach wilts, about 5 minutes. Remove the bay leaf and enjoy! Is anyone still out there? I hope so, because I’m back! I know, I know, it’s been awhile. I do have a good excuse, though, if you’re at all interested. I had a baby! Our little boy was born at the end of February. He surprised us by coming two months earlier than expected, but he is doing very well and is a strong and healthy boy. Words cannot express how thankful I am. It’s been a long time since I’ve really cooked anything, but now I’m trying my best to get back in the kitchen. I do miss cooking, but it’s been hard for me to get back into a routine. Hopefully the decision to revive my blog will give me the encouragement to get cooking! Luckily for me, fall is coming up, and that means soup weather! There’s nothing I love more than snuggling at home all day while yummy soup simmers in the crockpot. In my opinion, that’s one of the few good things about fall and winter! 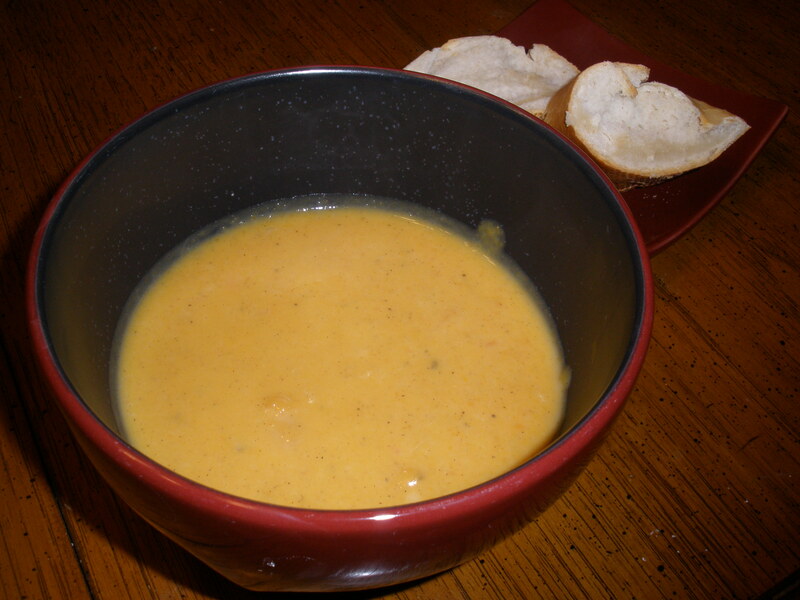 Here is our first soup of the fall and our first recipe after a long hiatus. Luckily, it’s a good one! I found this on Pinterest awhile back and, unfortunately, just now got around to making it. As it turns out, this recipe is delicious! Creamy tomato soup with chunky veggies and warm french bread for dipping … mmm, my mouth is watering again just thinking about it. This meatless meal is perfect for cold winter days, and is also budget-friendly. It gets 5 stars from us! Add tomatoes, celery, carrots, chicken broth, onions, oregano, basil, and bay leaf into your crockpot (I used a 3.5 quart crockpot, but any smaller would have been too small). Cook on low for 5-7 hours. About 30 minutes before serving, prepare a roux. Melt butter over low heat in a saucepan and add flour. Stir constantly with a whisk for 5-7 minutes. Slowly stir in 1 cup hot soup. Add another 3 cups and stir until smooth. Then, add this mixture back into the crockpot. Stir and add the Parmesan cheese, half and half, salt, and pepper. Cook on low for another 30 minutes or so until ready to serve. I have been craving cauliflower. I think it all started when I just kept hearing so much about cauliflower mashed potatoes. I just couldn’t imagine what this might taste like, but I knew I wanted to try it. My craving kept building up and building up until one day when I saw some cauliflower on sale at the grocery. I knew that it was finally time. 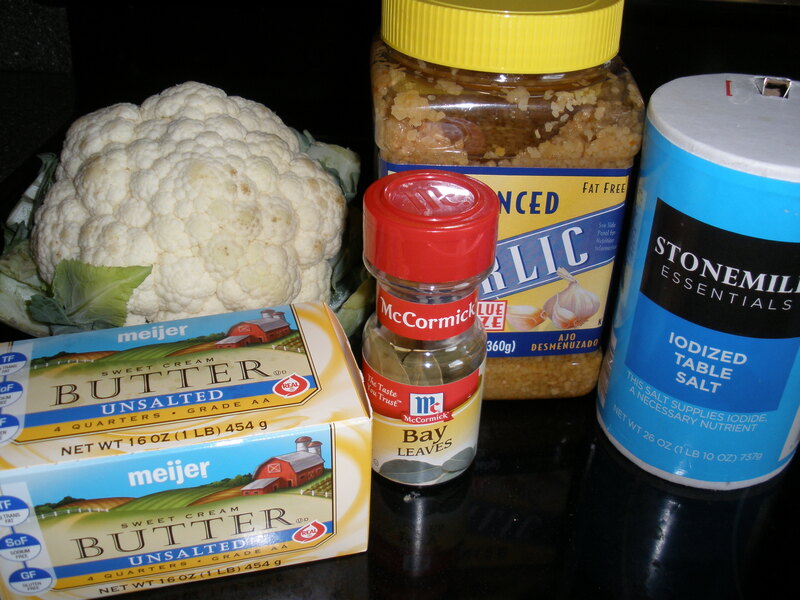 Cut the cauliflower into florets and place in your crockpot. Add in the water, garlic cloves, salt, and bay leaf. Cook on high for 2-3 hours or low for 4-6 hours. At end of cook time, remove the garlic cloves and bay leaf. Drain the water. Add in the butter and let it melt. 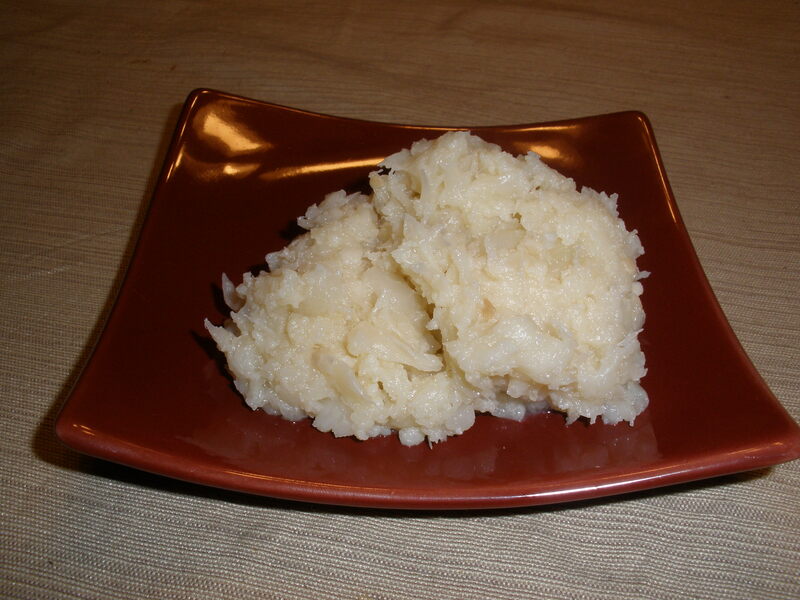 Use a potato masher, an immersion blender, or just a spoon to mash the cauliflower. If it needs milk, add it in a tablespoon at a time (I didn’t use any). Salt and pepper to taste. Serve with green onions if you have any (I wish I had!). I don’t know about you, but I have the hardest time going through an entire bag of potatoes before they go bad. I hate wasting food, but with potatoes, I just can’t help it. It’s not a huge problem, I guess, because they’re really cheap, but I still feel bad. So that’s why I put this on the menu during the same week I had planned on having Zuppa Toscana. I bought an 8-pound bag of potatoes for $3, and between both dishes, it used up about half of the bag. Then, maybe some baked potatoes for lunch on the weekend and some oven fries next week, and that should just about do it! 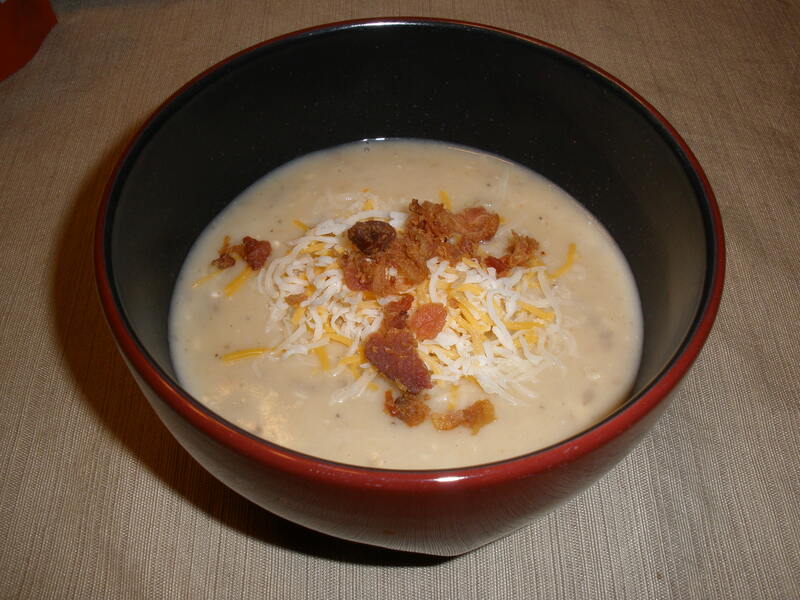 I had made a baked potato soup one other time, but wanted to try something different. I had saved this recipe from A Year of Slow Cooking, and since I had all the ingredients on hand—well, I had found a winner! This soup was very good. It was just the right amount of thickness—not too thick, not too thin. The cream cheese made it nice and creamy, and the seasonings were great. I used 1/2 tsp. of red pepper, which almost made it a little too spicy. I might cut it back next time, but if you like spiciness, go for the 1/2 tsp. Place the potatoes into your crockpot. Add onion and garlic. Sprinkle in the seasonings, and pour in the broth. Cook on low for 8 hours, or on high for 4. At end of cook time, use a potato masher or an immersion blender to mash the potatoes in the soup. After smashing the potatoes, crumble in the cream cheese and put the lid back on. Cook on high for about 30 minutes, or until the cream cheese is melted and completely incorporated. Stir a few times during the 30 minutes. Top with crumbled bacon, green onions, and cheddar cheese. Enjoy! Every now and then I’ll come across a recipe that just intrigues me. For whatever reason, I can’t get it out of my head. I think about it and think about it until I can finally put it on the menu. This very same thing happened to me when I saw the recipe for Curried Carrot and Sweet Potato Soup on Kitchen Stewardship. I was hesitant and curious about this recipe at the same time. It looked good. It sounded good. But would it taste good? I had never had anything like this before, so I really couldn’t imagine how it would taste. Plus, the curry was an up-in-the-air ingredient. Sometimes I like it, but if it’s overpowering, I really don’t. There was no way of guessing how this would turn out. Place potatoes, carrots, onion, curry powder, salt, pepper, cinnamon, and ginger in your crock pot. Add chicken broth and stir. Cook on low for 7-8 hours. Puree soup in a blender a few cups at a time or use an immersion blender. Stir in maple syrup and cream. Enjoy! This makes about 6+ servings. Shared at Lynn’s Kitchen Adventure’s Souper Monday. Hmm. I wasn’t sure about this recipe. But Stephanie over at Stephanie Cooks wasn’t so sure, either, and she assured me that both she and her husband loved this soup. Ok. If you say so. Well, she was right! This soup was delicious. After a quick taste test (and after I snapped the picture-sorry!) I decided this might be a good chance to try out my new immersion blender. I blended up two of the three servings of soup, and I must say, it was even better that way. Either way you eat it, this is a good, cheap, and filling meal. 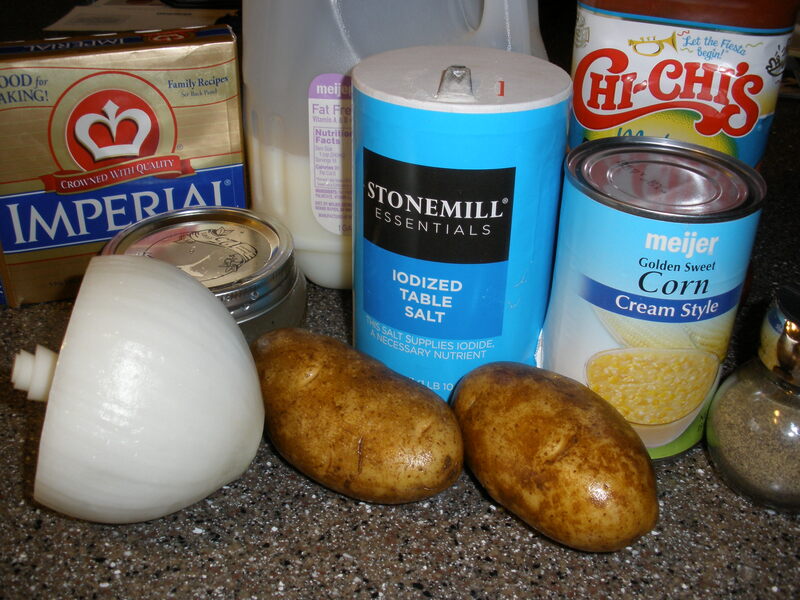 Place the first 7 ingredients in your crockpot. Stir to combine. Cook on low for 7-9 hours. At end of cook time, stir in the milk and the butter. Turn the crockpot up to high and allow to cook for another hour. Then, serve and enjoy! Way back in the fall of 2008, I decided to teach myself how to cook. Growing up, I never really learned to cook much of anything, but soon after I got married, I figured I’d better start learning. My first baby steps into the kitchen were through my crockpot. It seemed like a good place to start, seeing as how you just need to dump everything in and let it cook all day. Once I gained more confidence with crockpot cooking, I ventured out into other areas. To this day, I tell people that I learned how to cook by using my crockpot, and that’s why it still holds a special place in my heart. 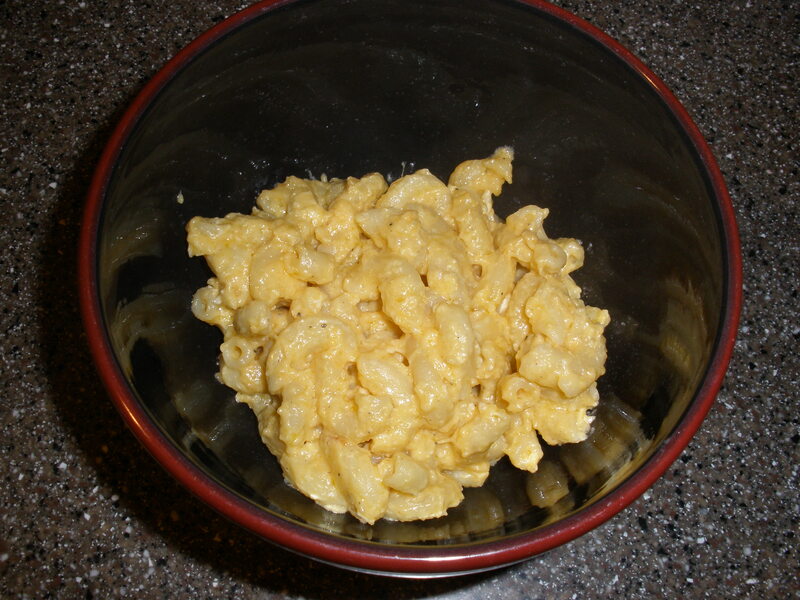 Anyway, this recipe for mac and cheese was one of the first recipes I had saved. And now, more than three years later, is the first time I’m getting around to making it! This recipe is really good, and tastes just like traditional mac and cheese. I would recommend going to this recipe when you’re entertaining or making food for a crowd. Throw this in the crockpot and it’s one less thing you have to worry about! On the stovetop, boil the macaroni for six minutes. Drain. 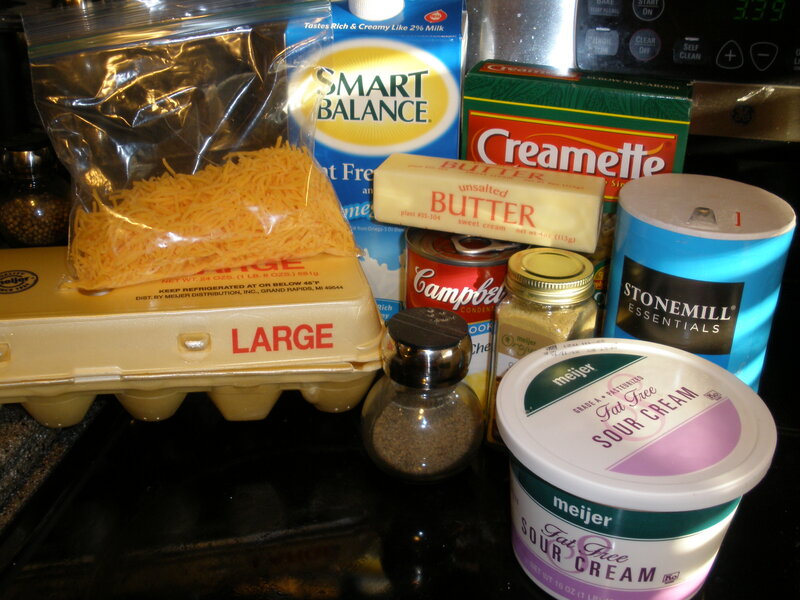 In your crockpot, add the cheese mixture, eggs, sour cream, soup, salt, milk, mustard, and pepper. Add the macaroni and stir. Cook on low for 2 1/2 hours, stirring occasionally (I stirred about every 45 minutes to an hour). Enjoy!